Columnist JJ Marsh (left) talks to “rucksack” urban fantasy writer Anthony St Clair about how he translates his travels into works of fiction. 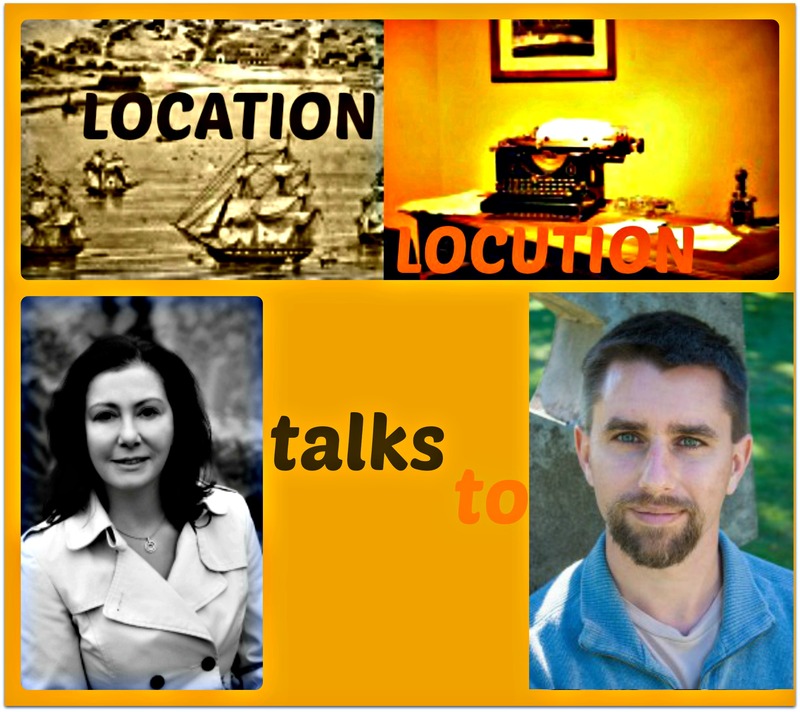 In this month’s Location, Locution, JJ Marsh talks to Anthony St. Clair, author of the Rucksack Universe books, a series of urban fantasy travel novels set in Hong Kong, India and Ireland. When he’s not concocting the kind of fiction that thrills, delights and bewilders in the spirit of Neil Gaiman, Terry Pratchett, Douglas Adams and Tom Robbins, St. Clair is making a living as a copywriter, blogger and editor. He loves writing about business and anything related to craft beer, homebrew, travel (he’s a self-described globe-trotter), food, and the Pacific Northwest. Location. 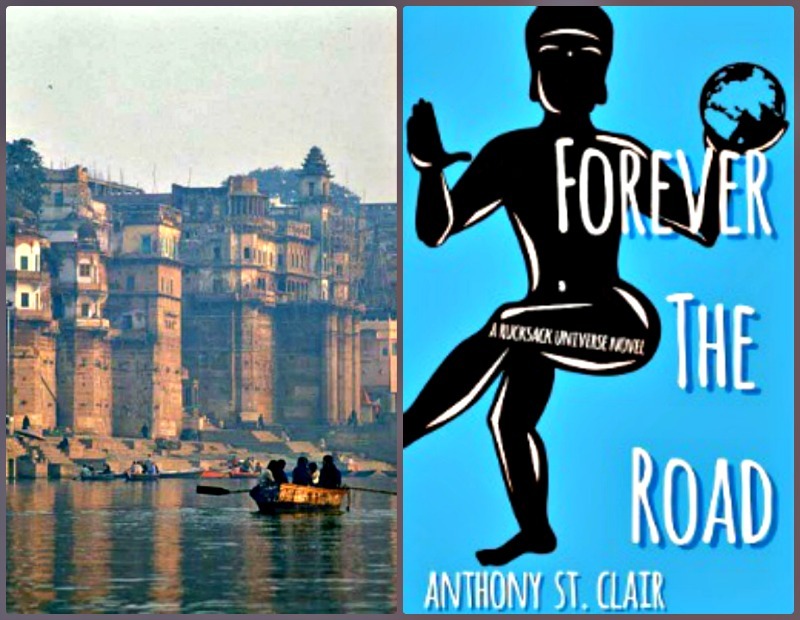 My original idea for Forever the Road, the most recently published book in my Rucksack Universe series, came to me in 2003, when I spent two months traveling through India. As the story took shape, I created a fictional city and river, both called Agamuskara, which is Hindi for “smiling fire.” Both the river and the city are pivotal to the action of the story and what happens with the book’s various characters. But I don’t think I could have come up with either the story or the location without having also traveled through India, especially the city of Varanasi, the holy city on the banks of the Ganges, which Agamuskara is based on. Photo credit: “Ganges River, Varanasi, Uttar Pradesh, India,” by Babasteve via Flickr (CC BY 2.0); Forever the Road cover art. Have you ever noticed that when you go somewhere new, it’s like you notice everything and experience it more intensely? It’s like our guard comes down. We see, hear, smell, taste, and touch with an intensity and openness that we don’t usually bring to our day-to-day encounters with the world outside ourselves. I try to relate the atmosphere of a place by evoking all the senses. Is the place hot or cold? Crowded or sparse? What does it smell like? What does the food taste like? What are the colors? Sense helps us get to know a place, and evoking the senses works just as well in a book as it does in actual travel. All of the above. Landscape, culture, and food affect each other. What the land is like affects the food that can be available. Place shapes culture, because place drives so much of our experiences. Likewise, food has an influence on how culture connects and evolves. After all, how many of our most pivotal experiences have to do with a meal, or a particular moment in a new place, or by experiencing and trying to understand an aspect of a different culture? This excerpt is from Chapter 2 of Forever the Road, which was released September 8th in e-book, all formats, and trade paperback (more information here). The rattling truck moved so fast that the world passed in a blur, but Jay marveled at all he saw. Countless people wore brilliant colors and smiled from weathered, driven faces. They defied the washed-out landscape and the humid mat of the air. Every village had been here before time was time, it seemed. Each village also brought a glimpse of temples and shrines, elephant-headed gods, bulls, monkeys, multi-limbed deities rendered in brick, stone, concrete, and reverence. Approaching Agamuskara, Jay now understood that India was four things: heat, humans, history, and gods. They shaped India not so much into a country or a culture but a world. India was all of the world, all of time in every passing moment, and every emotion, every depravity and transcendence, every hope realized and every futility suffered, of all the human race. And, gods, was India heat. Humid, blazing, sopping heat. India felt as if wet blankets had been baked for an hour in a pot of water, then, steaming and boiling, wrapped around the country. Even Jay’s sweat glands felt sluggish. The humidity jellied the will. It softened the wood of the few meager trees. Even the concrete blocks of houses and shacks seemed to sag, drip, and simmer in the midday, clear-sky blaze of sunlight. The truck turned onto a highway, renown throughout northeastern India for being maintained. The road reminded Jay of the interstate highways of his left-long-ago home, except that as far as the traffic was concerned, the four lanes were simultaneously one lane, three lanes, twenty lanes, and no lanes. Still, the truck’s consistent speed and motion brought a soothing breeze to Jay’s skin, and the smooth road took him from a blazing sear to a nearly gentle simmer. For once, Jay’s tenderized rump stayed in one merciful, bounceless spot. After a few kilometers, he relaxed like a roast chicken resting after coming out of the oven. I want to visit a place before I write about it, and so far all my stories draw on places I’ve visited. Whether or not I’ve traveled there, I also use substantial research to try to understand a place as best I can, but there is no substitute for having been there. Nothing compares with eating the food, walking the quiet streets at dawn, observing the tiny everyday details that make a place its own. I’ve spent many a time immersed in the works of Bill Bryson and Pico Iyer, and I try to bring their mix of place and experience into my own style. However, when it comes to using location in story, I admire Terry Pratchett the most. His long-running Discworld, a comic fantasy book series, is not only full of funny, richly told fantasy stories, but he clearly works hard to weave the setting into the story. Whether a book is set in a city or the mountains, it is always clear that a sense of place is key to the characters and events unfolding in the book. I try to evoke a similar connection in my own work. There’s an old saying that character is destiny, but I would add that place shapes character. Thank you, Anthony! That was fascinating. Readers, if this interview has piqued your curiosity about Anthony and his writings, I encourage you to visit his author site. You can also follow him on Twitter. Next up on Location, Locution: Susan Jane Gilman, Geneva resident and author of the New York Times bestseller The Ice Cream Queen of Orchard Street. Until then, I wish you happy holidays. See you next year!